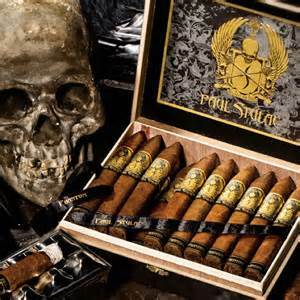 According to chow-line-rumors, the Internet, the labeling of Stulac cigars was to appeal to bikers and military types. That’s good, because the skulls, wings, shields, maces, and spears had me thinking about something to do with medieval times and heavy metal music! But, then, my formative years were the 80’s. The Angel gives the appearance of a tough cigar with promise of a good bite to it. The wrapper is Ecuadorian, and the filler is Nicaraguan. It has a good feel, not too many veins running up and down. When given a little squeeze, it has some give, not enough to turn someone away. Already, the medieval/heavy metal music motif is fading. It lights well and has a good easy draw, producing an average amount of smoke. The Angel burned evenly throughout and required no touch-ups. No splitting or cracking of the wrapper as I smoked it. The ash held together some, but not that long. The taste was a good creamy cocoa flavor that was very appealing. As the smoke progressed, cedar and spice became the main flavors and that lasted throughout the rest of the cigar. Along the way there was a bit of a fruity taste, nothing major, it was more of a hint of fruit. Not sure if that was just my taste buds but I did detect something that reminded me of fruit. By the end of the Angel it was obvious that my first impression from the label was wrong. The cigar rates on the medium level, with no bite to it at all. The label gives the impression that it’s a big bad cigar, but, in the end, the biker motif is all for show. Great artwork, though. The price hovers at $10 a stick, considerably over-priced for this type of cigar. The Angel is a good cigar, and one that I would smoke again, on occasion, but not one where I’d stock in my humidor.